Flip's new companion hardware to their pocket camcorders is a logical extension of the Flip brand. It brings Flip-taken videos (and nothing else) to a TV, and while some may find its simplicity refreshing, others will find it limiting. 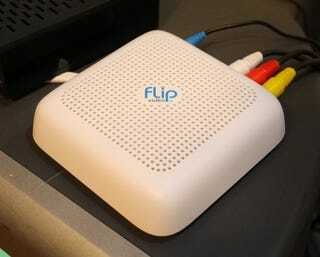 We knew about the FlipShare TV awhile ago, thanks to an FCC leak. It's basically a companion piece to Flip's camcorders, streaming video shot with the Mino HD, Ultra HD or what have you to a TV. But oddly enough, it's dumbed-down enough that it somehow circles back around and becomes complicated again, starting with the seemingly-basic hardware. The FlipShare TV is actually comprised of three necessary components: A cute, small, square white box about the size of a Roku that plugs into your TV (featuring RCA and HDMI ports); a fairly large USB dongle; and a super simple remote reminiscent of Apple's remote. The USB dongle is actually required to be plugged in (and your computer turned on) if you want to use the FlipShare TV at all, forming kind of an point-to-point wireless network. Yeah, it's supposed to eliminate the trouble of logging into a wireless home network, but it brings up problems of its own—what about multi-computer households? And while it may be a pre-release issue, my box dropped the connection with its dongle when the two were on opposite ends of my apartment, a problem my normal wireless router doesn't have. Also released today is the updated FlipShare 5.0 software, which is easy enough to use. Plug in a camcorder, drag its videos to your library, and your precious moments can then be watched on your computer or via the FlipShare TV, or alternately shared via Facebook or YouTube. Also supported are FlipChannels, a sort of private online video storage that lets you upload videos and "share" access with other people. Anyone with whom the FlipChannel is shared can watch your videos on a computer, mobile device (iPhone, Android, and BlackBerry are supported) or, again, through the FlipShare TV. So those are your two choices for streaming: Computer or FlipChannel. Therein lies another problem: The FlipShare TV can only play back the very specific video format used by Flip camcorders, some kind of WMV at 30fps. Nothing else. This is not a media streamer, it's a Flip streamer. Music? Forget it. Your ripped DVDs? No way. (JPEGs are also supported, but that's it for non-Flip media). Playback quality is good, but these aren't exactly super high-quality files we're dealing with here.